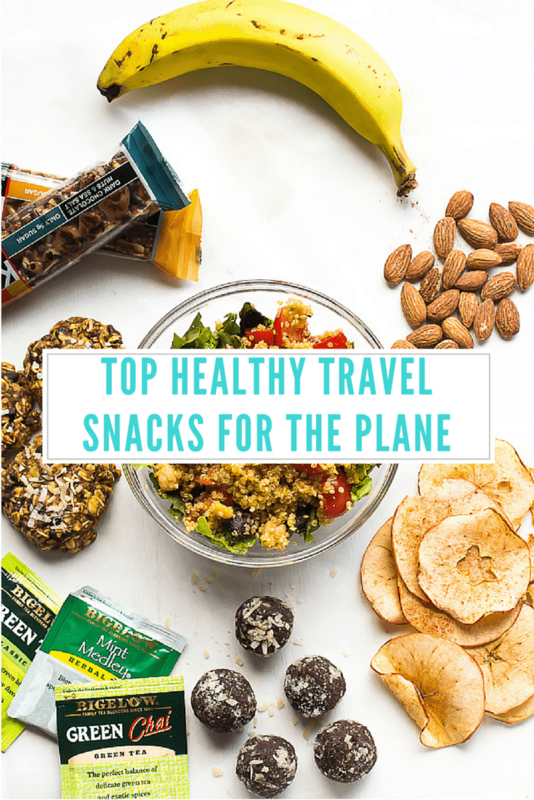 These are my Top Healthy Travel Snacks for the Plane – they are guaranteed to fill you up and keep you healthy while travelling! Tell me if this sounds familiar. You’re all set to travel! You reach the airport, you go through customs, and you’re waiting for your flight. Then it happens – you get hungry, and there is nothing healthy nearby. Or, if it is “healthy”, you’re wondering how is this so expensive?! If you follow me on Instagram: jessicainthekitchen, then you probably know that I *💕 * to travel! The Mr. and I realised that the part of travel that gets the least amount of attention is always the actual airport travel part. I feel like this always gets naturally pushed until the last minute to sort out, so we end up eating either overpriced airport snacks, or fattening foods that just make us feel sick for the entire trip. The best way to avoid this? Bringing healthy travel snacks for the plane and the airport. This post helps me to pre-prep for trip, so I hope it helps you too! 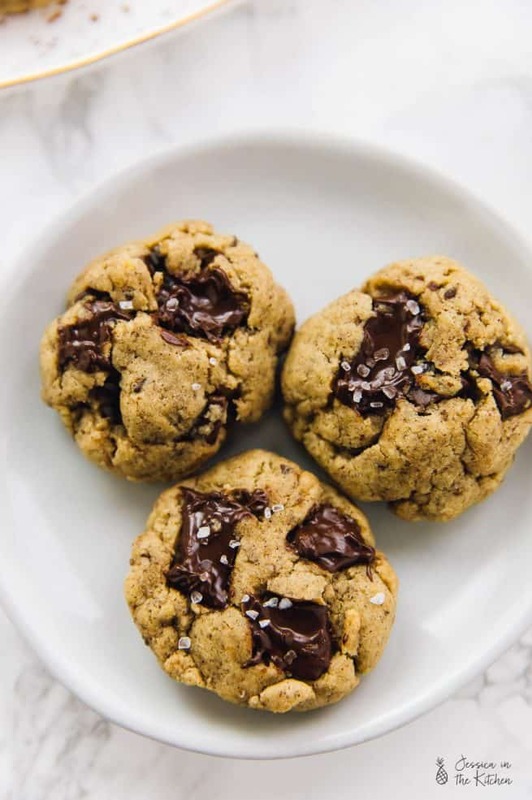 Breakfast Cookies are the perfect travel snacks because they are essentially oats, sweetener and your favourite additions all baked into a healthy delicious dessert-tasting cookie. Does it get better than that?! They are a one-bowl dish and provide lots of protein and fibre sustenance for you on your trip. My favourite breakfast cookies are my Pumpkin Chocolate Chip Oatmeal Breakfast Cookies (pictured above) and my Everything Breakfast Cookies. Almonds are a great quick snack and loaded with fibre, protein and calcium. I love roasted sea salt almonds and a handful is great for staving off hunger. This is also a super easy snack to pack and so convenient for the plane. Bananas are easy, quick, healthy, delicious and a perfectly portable plane snack. You basically can’t go wrong with bringing a banana with you. Tea! I am obsessed with tea. I love having several cups a day – I would like to say for the energy, which is does help with, but mainly because I just love the clean taste and how balanced I feel after drinking it. You can carry a tea packet on the plane and just ask your stewardess to bring you a mug of hot water and sweetener (I don’t put sugar in my tea but this is up to you) and you can just steep your tea. So easy. Green tea will help with energy, or if you get sick in the air, ginger tea is great for calming your nerves and your stomach. While I completely believe in making most things from scratch, I know very well how the night before/morning of a flight goes, plus the scenic chaos of the airport. Pre-packaged bars such as KIND Bars or LARABARS are perfect travel snacks for the plane because they are filled with only natural, healthy ingredients, are energy-packed, delicious and very convenient. Drink lots of water. Hydrate, hydrate, hydrate is my personal motto on a plane and I genuinely feel the difference when I don’t drink water. 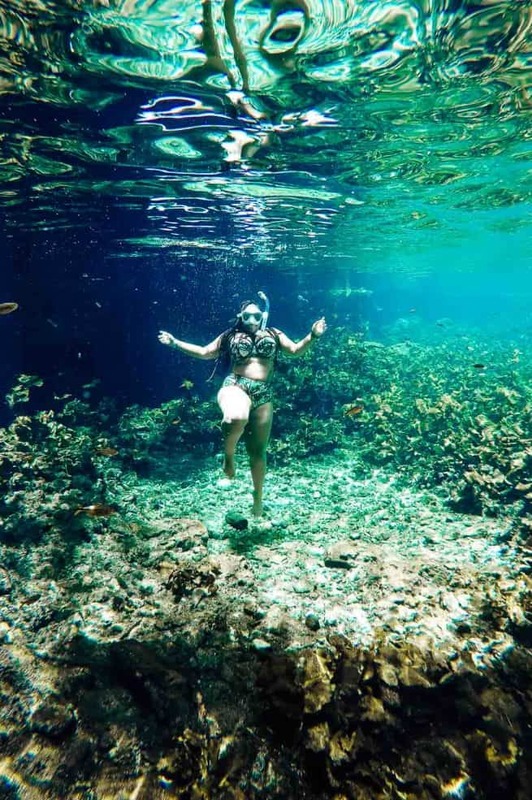 Water will help to combat the negative effects of recycled air that you’re breathing in, leaving you less likely to feel sick after flying and will help to keep you feeling refreshed. Skip the booze. It seems like a great idea (vacation! Or, fun work trip!) but the elevated heights and the recycled air will only leave you feeling sluggish, woozy and in the worst mood to finish your next 5+ hours of flying. Sleep! If you can sleep on the plane, I would highly recommend it, especially if it’s an overnight flight. Jet lag can be an absolute nightmare as I learned the hard way flying to Russia with no sleep (and literally shaking in my boots until I finally got some sleep). While plane sleep may not feel the most energising, a power nap will help you through the rest of your travels and allow you to feel refreshed when you reach your destination. Stretch. I know, counterintuitive to sleeping, but if you’re on a long flight, you should try to get up and walk around every now and then. Stretching your muscles can also help to prevent swollen ankles. Pack snacks. So we have come full circle, essentially! These snacks will help to keep you energised and healthy throughout your flight and are also great for the airport and your trip! If you end up with leftover bites or breakfast cookies, be sure to refrigerate them when you reach to your hotel room/destination so you can keep them, and any other snacks, throughout your trip. We got off a plane late last night from our Greece trip and although it wasn’t a long trip, we still took our own snacks to avoid airport food. Bananas are always a favourite to pack, as they keep me full. I hope you enjoyed Greece and congrats again Dannii!! Bananas are such a great snack! Have so much fun at the conference!! 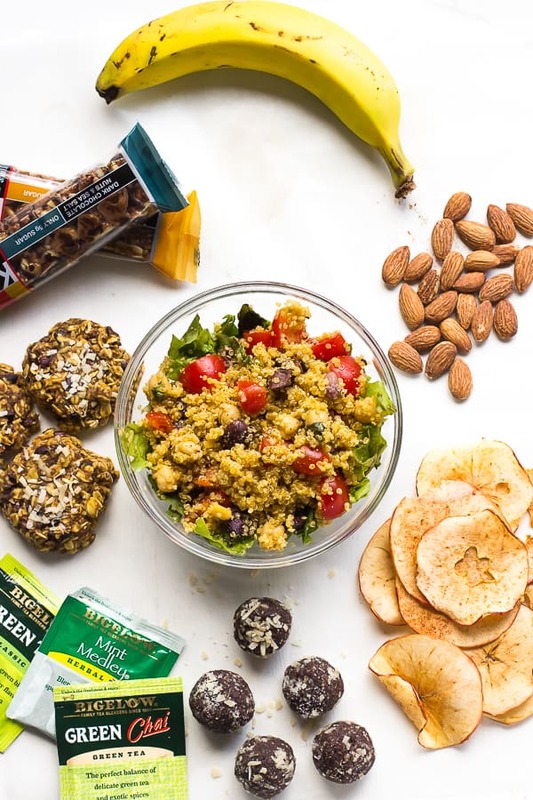 And such a great post – I’ve really started to be mindful about bringing healthy food with me while traveling lately (since sometimes it can be tough to find!) and man, does it make a difference! A really great post! I thoroughly enjoyed it. Thanks for these practical but delicious snacks that’s time efficient in terms of making them. Awesome. Deserves 3 thumbs up? Aw! Thanks so much Chineka! Yes I love tea!! Haha. Hey that’s amazing and informative post! Good healthy snacks eating ideas will enjoy the food while taking off in plane. This is a great post! 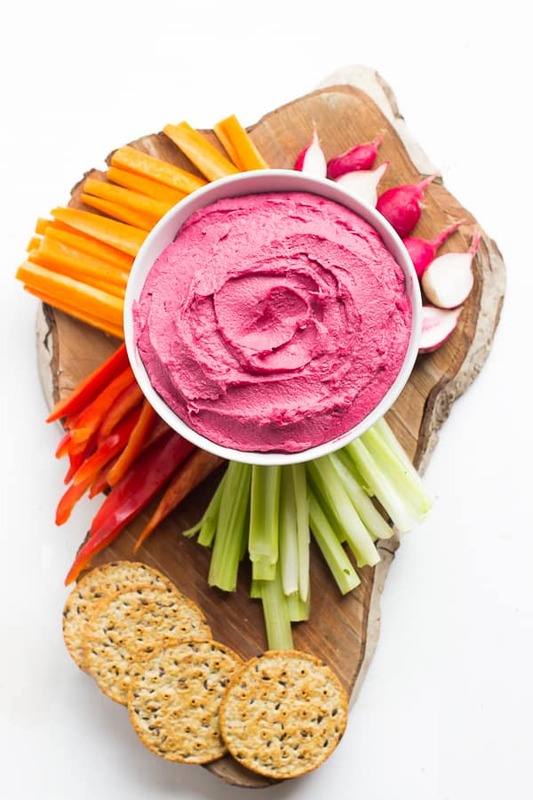 Everyone need snacks and it is great when they are healthy! Awesome ideas, Jessica! I thought you can not bring snacks on the plane with you made from home. I thought you could only bring airport prepared food on the airplane. How do you do this? is it because it is raw?? I’ve just always done this! I’ve never had a problem with it at all, I just bring it – in fact I know some people who bring cooked food with them on the plane! I hope that helps!